Announced today at the Official Google Blog, the statue of Ramses II - a major landmark in Cario, Egypt - is being moved to a new location. 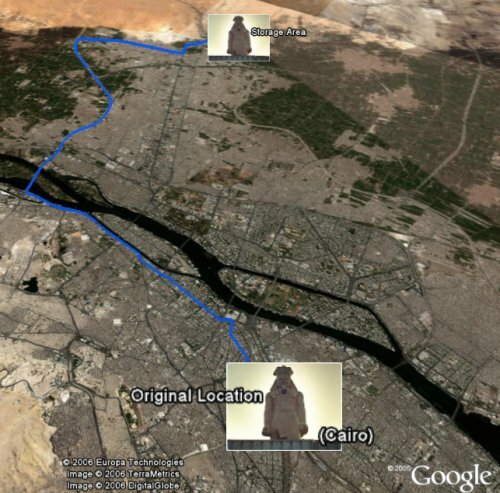 The engineers who planned the move used Google Earth to help plan the route. You can see the route in Google Earth here . If you double click the "Original Location" placemark (which will fly you there) and then deselect the placemark, you can just barely make out the statue (and its shadow) in the satellite photo of the Ramses Square. Here's a story about the planned move in USA Today.